Being a professional violinist (when Mrs. Bull moved to Crossville in 1993), Mrs. Bull approached her principal at Crossville Elementary (Maureen Hodges) for permission to do an experimental string class during her planning time. Having no classroom, no books, no instruments and a total of 600 regular music students, Mrs. Bull knew this would be a challenge. Mrs. Bull selected five students to participate in the 'experimental' string class. The class went VERY well. The following year more students were added and Mrs. Bull realized that the students needed a performance venue. The group "the City Strollers" was formed with the five original violinists. Foreseeing a need for an orchestra for these budding musicians, Mrs. Bull started classes in viola, cello and bass and started squeezing string classes into every possible space in her schedule. In 1997 the Children of Crossville Chamber Orchestra (C.O.C.C.O.) was formed with 18 string students. That December the orchestra was invited to perform for Governor Sundquist. Since then C.O.C.C.O. has won many trophies and awards at both the state and national level. C.O.C.C.O. has since grown into two orchestras: C.O.C.C.O. and the Children of Crossville Preparatory Orchestra (C.O.C.P.O.) EVERY student who has gone through C.O.C.C.O's orchestra program has gone onto college, many with music/academic scholarships. Since 2017 the Preparatory Orchestra has performed under the baton of Zac Carpenter, violinist/composer and former C.O.C.C.O student. Becky Bull was born in Baltimore, Maryland. She received the Bachelor's of Arts and Master of Education degrees from Towson University in Towson, Maryland. She had done post graduate studies at Belmont University in Nashville, Tennessee and New York University in New York. In August 2004 she attended Jay Ungar's Fiddle Camp at Ashokan, New York. Mrs Bull has taught strings since 1983 and currently teaches general music, band, string classes and orchestra at North Cumberland Elementary School. She also served for several years as a clinician at the Smoky Mountain Orchestra Camp at Maryville College in Maryville, Tennessee. Mrs. Bull currently maintains a private studio where she teaches violin, viola, cello, bass, and mandolin. Mrs. Bull has performed with many orchestra and ensembles in the Baltimore/Washington area. She has done extensive pit orchestra work for both musicals and operas. Mrs. Bull currently performs as principal violinist of the Cumberland Strings Quartet. Under Mrs. Bull's direction, the Children of Crossville Chamber Orchestra has won man awards. 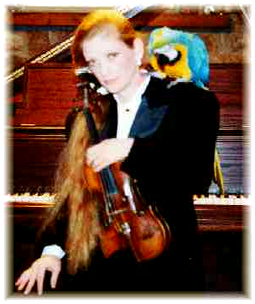 In 2003 she received her national certification as a string teacher with the Music Teacher's National Association. Some of her citations include the 1996 Butterfly Award (for bringing music to underprivileged children), the 1998 Crossville Elementary School Teacher of the Year, the 200 Business and Professional Women's Club "Woman of the year" and in 2001 she received the State of Tennessee's "Teacher of the Year" from the American String Teacher's Association." In 2001 she was also included in "who's Who of American Women". In 2002 she was in awarded the shw was included in "2000 Outstanding Teacher Award" from the Tennessee Governor's School of the Arts". In 2005, she was awarded the "Who's Who Among American Teacher's" and more recently has been nominated several times for the Elizabeth A.H. Green School Educator Award. In 2015 and 2016 she was also nominated for the GRAMMY Music Educator Award. On September 22, 2016 Mrs bull performed as a soloist with the Cumberland County Community Band under the baton of Glen Belcher. © 2019 COCCO: Children of Crossville Chamber Orchestra. All rights reserved.